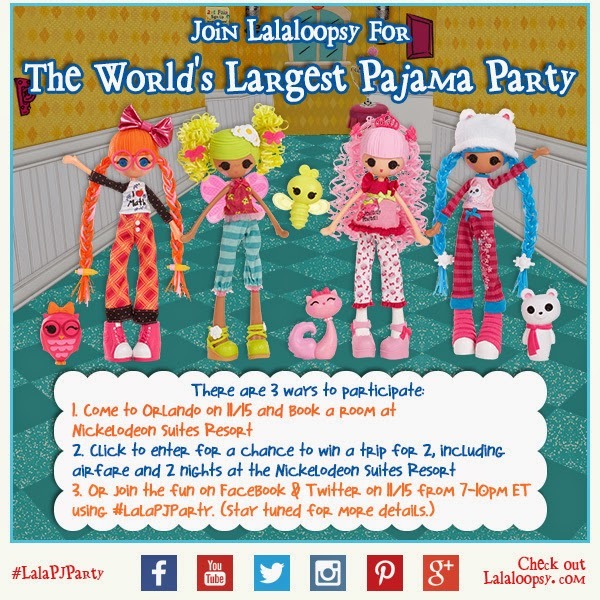 Lalaloopsy's World's Largest PJ Party will be held on November 15th from 7-10 ET (4-7PT). Join Lalaloopsy, live tweeting (Twitter.com/lalaloopsy) and Facebook posting (Facebook.com/lalaloopsy) from the event. Join the fun using the hashtag #LalaPJParty. You will have the ability to win prizes, answer trivia questions & have the chance to enjoy all the Lalaloopsy activities. You will have your own opportunity to have your very own sleepover from home. Enter to win a Lalaloospy Oven, contest open to U.S. residents only. Contest will end November 30th.